An interactive atlas for marine biodiversity conservation in the Coral Triangle Atlas for biodiversity conservation Irawan Asaad et al. An online atlas of the Coral Triangle region of the Indo-Pacific biogeographic realm was developed. This online atlas consists of the three interlinked parts: (1) Biodiversity Features; (2) Areas of Importance for Biodiversity Conservation; (3) recommended priorities for Marine Protected Area (MPA) Network Expansion (http://www.marine.auckland.ac.nz/CTMAPS). The first map, Biodiversity Features, provides comprehensive data on the region's marine protected areas and biodiversity features, threats, and environmental characteristics. The second provides spatial information on areas of high biodiversity conservation values, while the third map shows priority areas for expanding the current Coral Triangle MPA network. This atlas provides the most comprehensive biodiversity datasets that have been assembled for the region. The datasets were retrieved and generated systematically from various open-access sources. To engage a wider audience and to raise participation in biodiversity conservation, the maps were designed as an interactive and online atlas. This atlas presents representative information to promote a better understanding of the key marine and coastal biodiversity characteristics of the region and enables the application of marine biodiversity informatics to support marine ecosystem-based management in the Coral Triangle region. 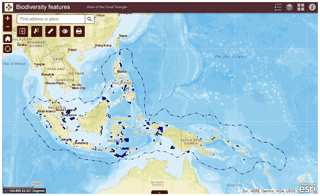 Asaad, I., Lundquist, C. J., Erdmann, M. V., and Costello, M. J.: An interactive atlas for marine biodiversity conservation in the Coral Triangle, Earth Syst. Sci. Data, 11, 163-174, https://doi.org/10.5194/essd-11-163-2019, 2019. The advancement of internet technology has led to the development of marine biodiversity informatics, namely information technologies that are employed to support the management of data and information on marine biodiversity (Bisby, 2000; Heidorn, 2011; Parr and Thessen, 2018). They enable people to freely access primary and secondary data over online systems, promote integration of data across datasets, and facilitate collaboration between parties (Costello and Vanden Berghe, 2006). Publicly available biodiversity information is important for engaging the public and policymakers in the addressing of global issues that threaten ecosystem services and functions such as biodiversity loss, climate change, habitat destruction, and overfishing (Costello, 2009). Integration of data across disciplines is increasingly imperative, as biodiversity research requires interactions with other related fields (e.g., genomics, oceanography, climatology, evolution) to foster better analyses and interpretations (Reichman et al., 2011; Costello et al., 2013). There has been massive improvement in online biodiversity databases covering species names (e.g., WoRMS; Horton et al., 2016), species occurrence records (e.g., GBIF; GBIF, 2018), OBIS; OBIS, 2015), species ranges (e.g., Map of Life: Jetz et al., 2012, AquaMaps; Kaschner et al., 2016), species protection status (e.g., IUCN Redlist; UNEP-WCMC, 2015), biodiversity and fisheries-related data (e.g., Sea Around Us; Pauly and Zeller, 2015), and taxa specific information (e.g., FishBase; Froese and Pauly, 2016, AlgaeBase; Guiry and Guiry, 2018, and sea turtles; Kot et al., 2015) that are managed, curated, and supported by international projects and initiatives. However, the culture of data publishing is still a concern (Costello et al., 2013). Less than 1 % of ecological data is accessible after publication (Reichman et al., 2011) and more than 57 % of the papers in environmental biology publications examined in a 2011 review had not released their data (Alsheikh-Ali et al., 2011). Biodiversity informatics is expected to grow exponentially. Software, infrastructure, and management tools to store, publish, and share biodiversity data, particularly over the internet and World Wide Web, have been improved significantly in recent years (Michener, 2015). Such development is supported by the availability of metadata standards to facilitate description of datasets and data records (e.g., Ecological metadata language (EML); Michener et al., 1997); Darwin core; GBIF, 2010), widely assessed repositories for depositing ecologically relevant data (e.g., Dryad; http://datadryad.org/; Figshare; https://figshare.com/; KNB; https://knb.ecoinformatics.org/) and a variety of open-source data management tools (e.g., MySQL, R, and Kepler). Geographic information systems (GIS) provide a tool to explore spatial relationships within and between data (Wright et al., 2016; Hamylton, 2017), and there is a growing trend of internet-based GIS (i.e., GIS designed for operating online over the World Wide Web) (Morets, 2017). The application of internet GIS through online atlases (the process of designing, generating, and delivering maps on the internet) provides a number of advantages over traditional desktop-based GIS (Neumann, 2008). Web-based maps can deliver up to date data, can be generated using a low-cost software and hardware infrastructure, and facilitate inexpensive map distributions. In addition, online atlases enables the integration of different data sources and collaborative mapping (e.g., Google Maps, Openstreet Maps; Neumann, 2008; Fu and Sun, 2010; Clarke, 2014). These geo-based websites applications are supported by Open GIS infrastructure that allow users in the world to access and operate GIS and to facilitate the exchange of spatial data and information (Sui, 2014). In the biodiversity conservation discipline, online atlases offer greater accessibility and allow for user-driven interaction (Peterson, 2018). Furthermore, the advancement of smartphone applications (apps) that are linked to mobile web-based maps provides an avenue to involve broader audiences in the natural sciences and a convenient tool for scientists to disseminate their research (Teacher et al., 2013; Marchante et al., 2017). Online atlases exist for several coastal regions, including Ireland's Marine Atlas (https://atlas.marine.ie/), the Oregon Coastal Atlas (https://www.coastalatlas.net/), and the European Atlas of the Seas (Barale et al., 2015). These coastal web-atlases serve a variety of functions, including being data repositories, and allow users to explore and overlay different data with geospatial analysis tools. Therefore, Wright et al. (2011) define the coastal online atlas as “a collection of maps with supplementary tables, illustrations, and information which systematically illustrate the coast”. To take advantage of the potential of online atlases, here we developed an application for the Coral Triangle (CT) region of the Indo-Pacific realm, a marine area situated between the Indian Ocean and Pacific Ocean and a global focus for marine biodiversity conservation due to its superlative species richness and endemicity. This region is considered to contain the world's highest number of shallow-water reef-building coral species (Veron et al., 2009), reef fishes (Allen, 2008), mangrove biodiversity (Polidoro et al., 2010; Walton et al., 2014), mushroom corals (Hoeksema, 2007), and razor clams (Saeedi et al., 2016), with areas of high biodiversity importance clustered along the southern part of the Philippines, the northeastern part of Malaysian Sabah, the central to eastern part of Indonesia, the eastern part of Papua New Guinea, and the Solomon Islands (Asaad et al., 2018a). Although considerable biodiversity and natural resources data have been collected for the region by scientists and conservation programmes, the data have been scattered and difficult to access. While our prioritization of locations for marine protected areas (MPAs) (Asaad et al., 2018a, b) was successfully collating data of biodiversity features, threats, and environmental variables, this did not make it easily viewable to the public. In addition, a previous online atlas of the CT was developed to support coral reef management and provided biophysical and MPA data from the region (Cros et al., 2014), but was more limited in data on species ranges (e.g., threatened species, endemic species). Thus, updated, more systematic and comprehensive “biodiversity informatics” datasets are required to showcase all of the available data in the region. This online atlas aims to support the objective of the CTI-CFF initiative (the Coral Triangle Initiative on Coral Reefs, Fisheries, and Food Security). The CTI-CFF initiative is a multilateral partnership of six countries (Indonesia, Malaysia, Papua New Guinea, the Philippines, Solomon Islands, and Timor-Leste) working collaboratively to conserve and sustainably manage their coastal and marine resources (CTI-CFF, 2009). One of the objectives of the Coral Triangle Initiative is to establish and effectively manage MPAs within the region, including a region-wide Coral Triangle MPA system (CTMPAS) (CTI-CFF, 2009). The CTMPAS is a system of MPAs within the CT which includes a range of MPA types and MPA network. This system comprises MPAs that form local ecological and/or governance networks that are nested within larger-scale social networks (CTI-CFF, 2013). Thus, the collections of geospatial data collated in this online GIS database support the development of MPAs and management of marine resources in the region by giving access to policymakers, scientists, and the general public to the most comprehensive, up-to-date and integrated spatial information available for the Coral Triangle. This atlas was developed to interactively display geo-referenced biodiversity information on the Coral Triangle (CT): (1) Biodiversity Features; (2) Areas of Importance for Biodiversity Conservation; and (3) priority areas for Marine Protected Area (MPA) Network Expansion. To generate the atlas, related datasets were retrieved from the Coral Triangle database collected in the previous chapters (Asaad et al., 2018a, b). These datasets were collated and developed from various sources (Table 1). For consistency, all the datasets were clipped to the CT region following the implementation boundary of the Coral Triangle Initiative (CTI-CFF, 2009) with bounding geographic coordinates of 23∘ N to 16∘ S and 90 to 175∘ E. All of the data preparations were performed using ArcGIS Desktop 10.5 (ESRI, 2016) and ArcGIS Pro. 2.0 (ESRI, 2017). Table 1Coral Triangle datasets specifications. 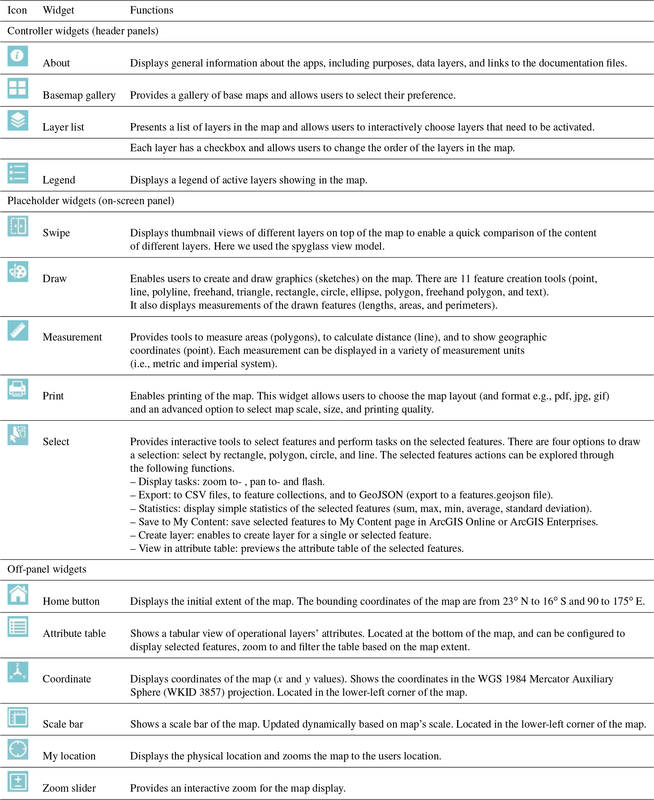 The ArcGIS Pro 2.0 was used to deliver and share all of the maps to web feature layers in ArcGIS Online, and design three digital maps using the ArcGIS Online template. Here, a similar template was used for each map to allow map comparisons. These digital maps used a website as an interface and can be accessed from any computer or other electronic device that is connected to the internet using a standard browser (e.g., Internet Explorer, Google Chrome, or Safari). The maps were hosted by ArcGIS Online in a cloud service provided by the Amazon EC2 (Elastic Compute Cloud). The map of “biodiversity features” is comprised of 10 feature layers, including (a) seven layers of biodiversity features (biogenic habitat, species richness-ranges, species richness-occurrence, species of conservation concern, species of restricted range, important areas for sea turtles and habitat rugosity; (b) two types of threat (anthropogenic and climate change); and (c) a composite of 16 environmental variables (Table 1). The map of “areas of importance for biodiversity conservation” is comprised of two feature layers: (a) regional biodiversity hotspots; and (b) sites of biodiversity importance (Table 1). The map of “priority areas for marine protected area network expansion” consists of nine feature layers: (a) three layers highlighting recommended priority areas for expansion of the Coral Triangle MPA network under scenarios of regional expansion to encompass 10 %, 20 %, and 30 % of CT marine area within the network; and (b) six layers showing priority areas for expansion of individual CT country MPA networks for Indonesia, Malaysia, the Philippines, Papua New Guinea, Solomon Islands and Timor-Leste. Each layer of the national priority areas is comprised of three scenarios of MPA expansion (10 %, 20 %, 30 %) (Table 1). Three base layers are included for each web map: existing marine protected areas, national exclusive economic zones (EEZs) and country boundaries (Table 1). To access the maps, a gallery-like web front page was developed with a hyperlink to each digital map. 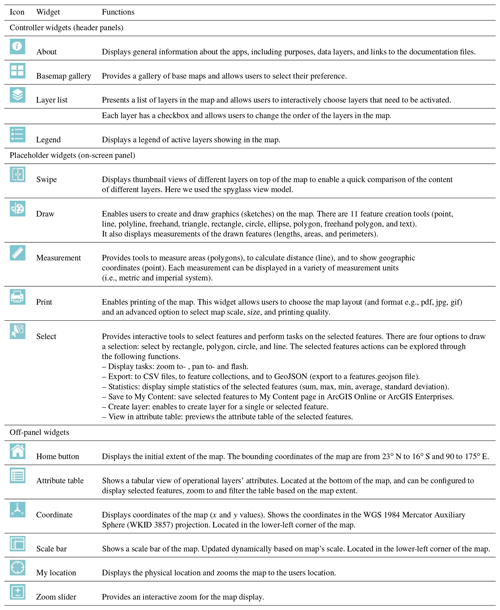 To allow users to explore a wide variety of functions offered by the maps, 15 types of widgets (a control element in a graphical user interface) were embedded (e.g., Home button, Layer list, Select, Draw; see Table 2). A documentation website was developed to define the map's objectives, datasets, classifications, and original citations of the sources. Table 2Widgets provided for the Coral Triangle Atlas. Figure 1Coral Triangle web-mapping application front-page. 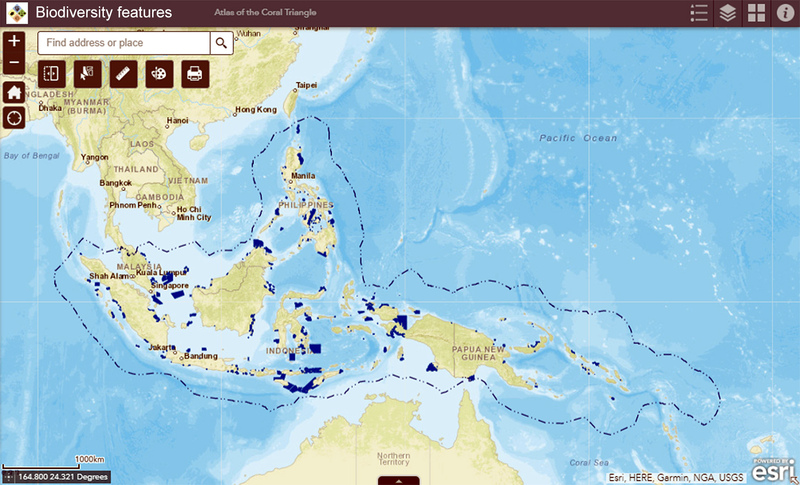 This gallery-like interface provides a hyperlink to access each of the maps of the Coral Triangle Atlas. 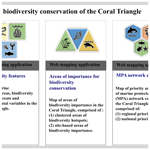 Figure 2The interface of the Atlas of the Biodiversity Conservation of the Coral Triangle. The Coral Triangle countries' EEZs (blue-dashed line) and distribution of marine protected areas (blue) are indicated. The atlas of the Coral Triangle is an online GIS database, and can be assessed through a web front-page (http://www.marine.auckland.ac.nz/CTMAPS; Fig. 1). These geospatial datasets were built on three interlinked themes: (a) Biodiversity Features (http://marine.auckland.ac.nz/CT_Biodiversity; Fig. 2), which provides comprehensive data on the region's marine protected areas, biodiversity features, threats, and environmental characteristics; (b) Areas of Importance for Biodiversity Conservation (http://www.marine.auckland.ac.nz/CT_Priority), which provides spatial distributions of areas of high biodiversity conservation value; and (c) priority areas for Coral Triangle Marine Protected Area (MPA) Network Expansion (http://www.marine.auckland.ac.nz/CT_MPA), which provides spatial information of priority areas for potential expansion of the existing MPA network. Relevant information on the maps can be accessed through an accompanying documentation website (https://sites.google.com/view/coral-triangle-digital-map). The “Data availability” is covered in the results section. The atlas of the Coral Triangle showcases all of the currently available marine biodiversity conservation data for the Coral Triangle region. They are derived from the most comprehensive biodiversity conservation datasets for the region, featuring spatial information for the region based on their habitat and species-specific attributes, vulnerabilities to threats, and environmental characteristics. 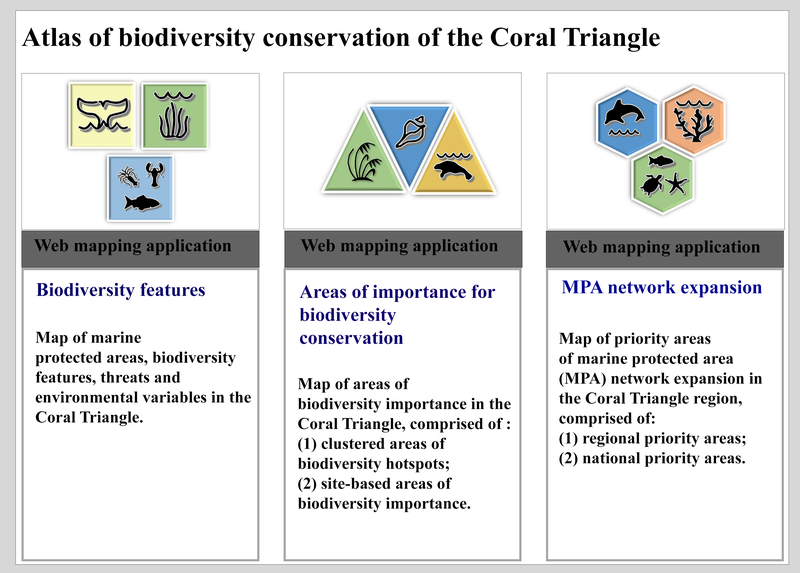 The maps also include a set of data to indicate areas of importance for biodiversity conservation, existing MPAs, and priority areas of the designation of new MPAs or MPA expansion in the Coral Triangle, showing priorities for biodiversity conservation at both regional and national scales. Collating and comparing datasets from different sources presented a number of challenges. To have a consistent format and spatial attributes, all datasets were converted into a vector format (i.e., lines or polygon shape) and standardized geographic projections. To reduce data discrepancy, the biodiversity feature datasets were classified using equal interval classes based on their biodiversity values. The datasets were then grouped into themes (biodiversity features, areas of important for biodiversity conservation, and priority areas for MPA network expansion). Each theme consists of sub-themes, to promote simple indexing, retrieving, and data management. Here, this study showed that for conducting a biodiversity conservation programme, biodiversity data are indeed available, yet they are frequently scattered and not always easily accessed. Using an approach such as the one we describe here, these widely scattered datasets can be integrated and amalgamated to perform such complex tasks as biodiversity prioritization analysis (Asaad et al., 2018a, b). This study developed an interactive web application that featured maps and geospatial contents using a configurable template provided by ArcGIS Online. This approach reduces the complexity of code writing, website programming, and other technical knowledge needed to create a web map. We opted to use accessible and less technical tools, to show that even with limited skills in internet GIS and web development, scientific communities have an opportunity to develop geospatial tools to support biodiversity conservation. Replication of this type of approach in the other regions is important as there is a continuing trend of biodiversity loss and limited resources are available to protect all of the important biodiversity. This atlas could be linked to the previous Coral Triangle Atlas developed by Cros et al. (2014) that is currently managed by the Coral Triangle Initiative Secretariat. These atlases are complementary in design and applications and may provide options to stakeholders to retrieve reliable Coral Triangle data. 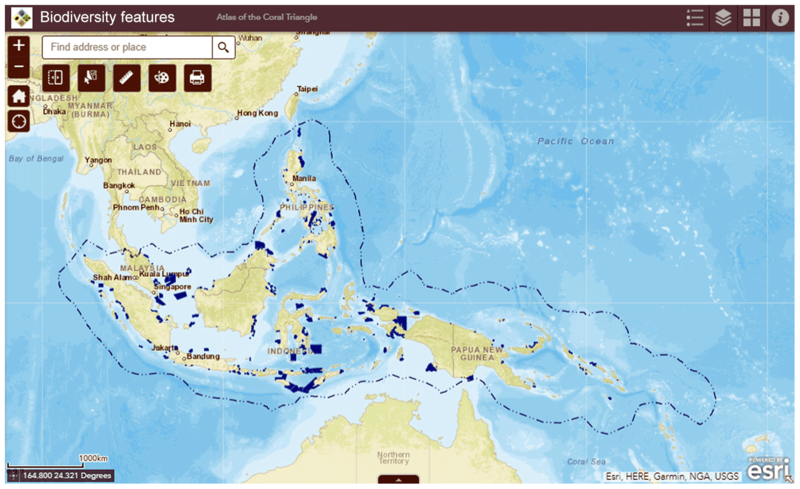 Here, our atlas provides a supplement and enriches the previous atlas by providing access to explore areas of biodiversity importance within the coral Triangle and a set of priority areas to designate new MPA within the region. We integrated ecological and biological datasets following standard ecological criteria to identify areas for biodiversity conservation (Asaad et al., 2016). Our “Biodiversity Features” datasets are comprised of biogenic habitat, species richness-occurrences, species richness-ranges, species of conservation concern, restricted range species, areas important for life history stage of species, and habitat rugosity. The datasets are ready to use and are applicable for identifying priority areas for biodiversity conservation. In addition, this atlas included datasets of threats, comprised of present anthropogenic and projected climate change induced pressures. Knowledge of threat level provides key information for developing alternative marine spatial planning and management strategies, e.g., enforcement, habitat restoration, and mitigation (Green et al., 2009; McLeod et al., 2010; Maynard et al., 2015). Furthermore, this atlas also provided data for 16 environmental variables (including physical, chemical, and oceanographic variables). As such, this atlas offers an opportunity to explore the relationship between biologically diverse areas and underlying physical and chemical parameters, as well as the relationship with potential pressure factors. In this atlas, the biogenic habitat distribution map was retrieved from three types of coastal habitat (coral reefs, seagrass, and mangroves) that may generate a bias towards coastal regions. A detailed habitat map and a defined list of habitat types are needed to fully evaluate the ecological and biological significance of the marine area. In addition, this atlas focuses on the biodiversity features within the economic exclusive zones (EEZs) of the Coral Triangle countries. There are vast resources found outside the EEZ including some of the most productive ecosystems (e.g., seamounts, hydrothermal vents), rare and unique species, and migratory routes of endangered marine species. Thus, biodiversity data of areas beyond national jurisdictions potentially complement the EEZ data to improve and develop a comprehensive biodiversity conservation programme in the region. There are opportunities to improve and advance the geospatial functionality of this Coral Triangle atlas. An envisioned future version of this atlas is a dynamic online database which provides tools to add, upload and store new biodiversity data (e.g., species occurrence data). The growing trend of citizen science opens an opportunity to collect and integrate potentially massive amounts of data to fill gaps in the biodiversity data records. In addition, the availability of options for running online spatial analysis tasks such as identifying priority areas or delineating protected reserves in a defined geographic area or for a specific dataset may offer an opportunity to further enhance the performance of this atlas. This atlas may be used by initiatives such as IODE–ICAN (International Coastal Atlas Network), the Global Health Ocean Index (http://www.oceanhealthindex.org/), the GEO-Marine Biodiversity Observation Network (https://boninabox.geobon.org/), UNEP-WCMC Network (http://data.unep-wcmc.org/), and others network related to the UN SDG Goal 14 and the upcoming UN Decade of Ocean Science. This type of atlas fills a regional gap in data within such global initiatives and provides more detailed information that can be used to develop a region-based biodiversity conservation strategy. The collections of geospatial data collated on this online GIS database are aimed to give access to policymakers, scientific communities, and the general public full access to the most comprehensive, up-to-date, and integrated spatial information available for the Coral Triangle. This atlas presents representative information to promote a better understanding of important areas for biodiversity conservation and the application of marine biodiversity informatics to support conservation prioritization in the Coral Triangle region. IA conceived the research ideas, designed the methodology, developed the web GIS applications, and wrote the manuscript. CJL gave advice and guidance in the study design, interpretation of the research, and reviewed the manuscript for scientific rigor and readability. MVE gave advice and guidance in the study design, interpretation of the research, and reviewed the manuscript for scientific rigor and readability. MJC gave advice and guidance in the study design, interpretation of the research, and reviewed the manuscript for scientific rigor and readability. Irawan Asaad is supported by the New Zealand Aid Programme through the New Zealand ASEAN Scholarship. We would like to thank Dr Tilmann Steinmetz (NIWA – Wellington), Keith Van Graafeiland (ESRI – Redlands), Graeme Glen, and Robert Carter (UoA – Auckland) for their technical assistance in developing this online atlas.